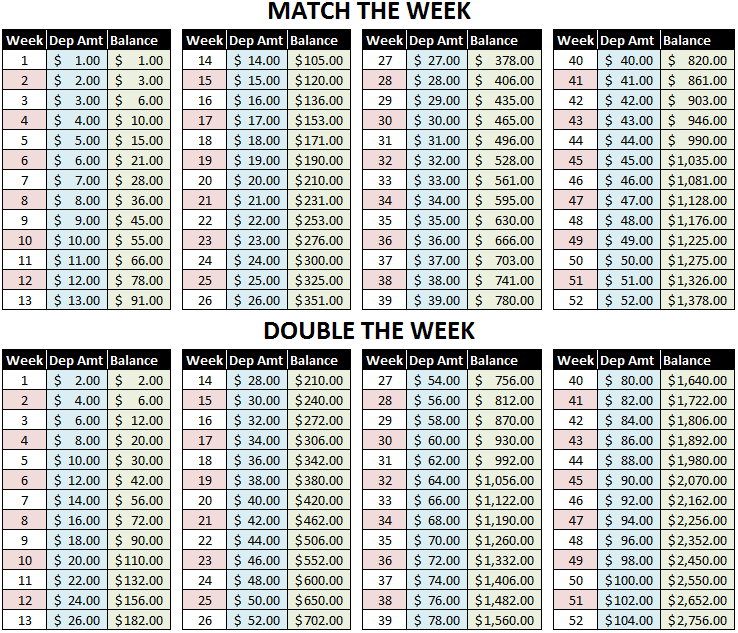 Are you participating in a 52 Week Savings game? I figured I would draft up a cheat sheet to help others stay on course. In addition I also calculated a second version called “Double The Week” which is a bit more aggressive but doable nonetheless, depending on your competitive spirit. If you are participating I would like to know how you are keeping focused and how are you reminding yourself. I’m a database administrator so I decided to set up an agent job that runs every Wednesday and executes a procedure that calculates the week number, deposit amount and then it sends me a reminder via email after it records it to my [Weeks] table. I also added another table called [NotifyList] which allows me to add additional email addresses so the notifications can be sent out to my wife or other addresses I use, which hits my cell phone. It’s pretty straightforward and has been working fine. If you would like to download a copy of my little illustration just click on the image below.